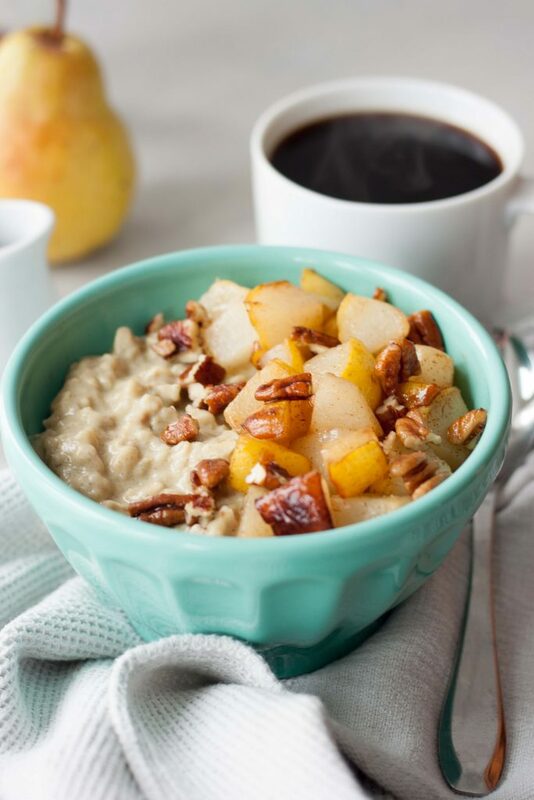 Monday, only a week until Christmas and a bowl of Maca Maple Oatmeal is going to make my morning! It’s cold and so often I wake up craving something warm and comforting and A (my youngest daughter) also loves her oatmeal. 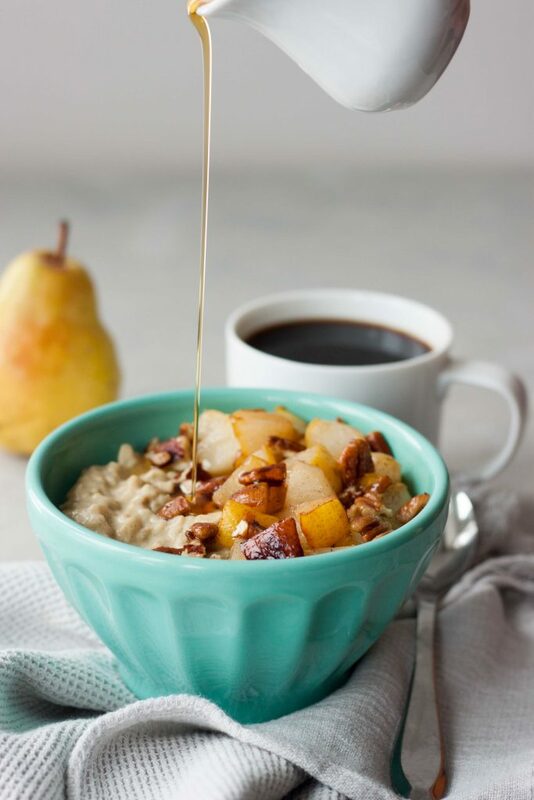 There is nothing more comforting then a warm bowl of oatmeal in the morning when it’s cold out and it’s such a great way to start the day and fuel up. This combo though is one of my favorites, if making it for the girls I omit the maca but the simple combo of maple syrup and sautéed cinnamon pears or caramelized bananas with or with nuts still hits the spot! It’s packed with so much flavor and nutrition that is just what I need on busy days like this week but this is also a great way to fuel up for winter activities or warm up after a morning hike or run. You’ve heard me talk about my love for maca before, and as I said you can make it without, it’s been a staple for so many years first for fertility reasons and most recently for balancing hormones, it’s adaptogenic like qualities that help my body deal with stress, and enhance stamina and energy. It’s a fiber-rich food, a good source of plant protein, and is also packed with essential fatty acids. I like gelatinized maca powder as it’s easier to digest. When making them on the stove I like to cook the oats in maple water. It’s high in magnesium, minerals, antioxidants, and electrolytes. Plain water can also be used. When making overnight oats, hot or cold, I use non dairy milk. I’ve included my overnight version below in the notes which can be made with protein powder or chia seeds. I like to stir in vanilla protein powder to these oats to make them extra creamy and add plant protein (and added nutrition depending on the protein powder used). Up until a couple weeks ago I was enjoying my Maca Maple Oatmeal with caramelized bananas and pecans, walnuts, chia seeds, or Navtias Organics Maca Maple Cashews. I will seriously cry the day they stop making those. My recent obsession with Candied Maple Pecans, which take only a couple minutes to make on the stove with a few simple ingredients, switched things up and a scraped the all my photos and my whole post to share this version with sautéed pears and Candied Maple Pecans. It’s so good and so comforting I won’t tell you how many days I’ve come home from a late morning barre class in the last couple weeks and made them for lunch. With so much to do this week before Christmas these will be on repeat for sure and one of my favorite ways to enjoy my daily dose of maca! With that I’m thinking about taking the next two weeks off from posting so I can focus on getting a few things done and spend lots of quality time with the family. I have a couple things I want to still share before the end of the year so I might end up posting them otherwise I’ll be sharing them over on Instagram. Which Instagram has been seeming a little quiet lately, I know I’m right there included not posting as much other then stories, and I hope that means everyone is spending the holiday season with friends and family. With that there will not be a Meatless Monday link up next Monday as it is Christmas but will return on New Years Day. 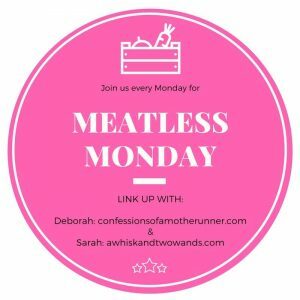 As this is our last Meatless Monday for the year I’d love to get your thoughts on what you’d like to see next year, do you want it to continue, see something different, have a theme, ect. Share in the comments below or feel free to send Deborah or me a message. With that we would like to see what you have for this last Meatless Monday of the year and what’s cooking in your kitchen. 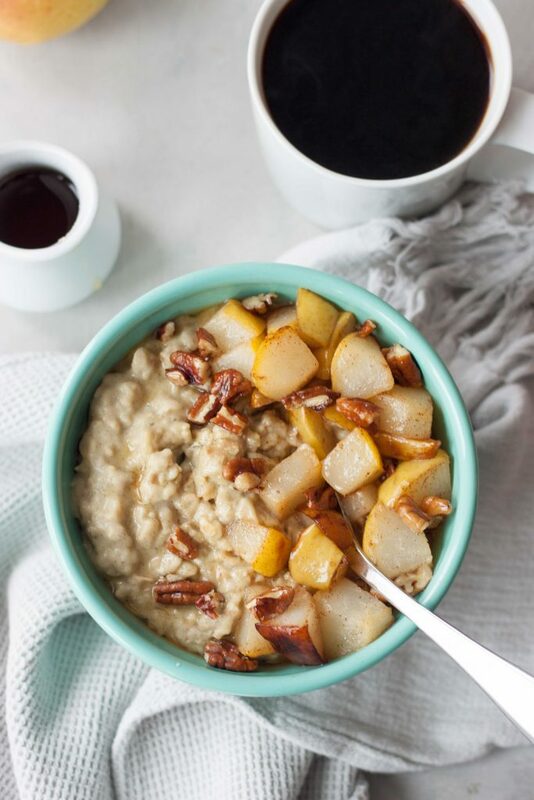 Creamy comforting bowl of Maca Maple Oatmeal will fuel you up for whatever you have planned for the day. Packed with plantbased protein, nutrtion, and superfood boost this simply sweet combination is a great way to start the day. 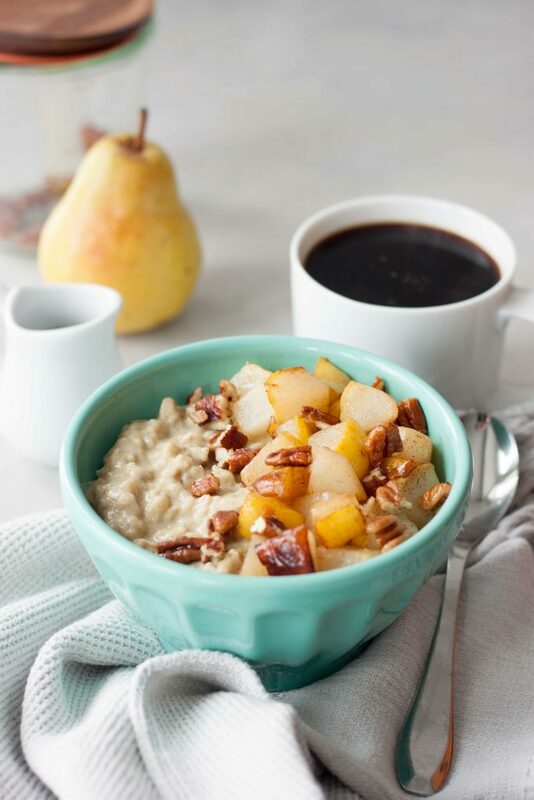 Sauteed pears or camalized bananas with Candied Maple Pecans are favorite topping choices but the options are endless. Gluten free and vegan friendly. Cook oats per package instructions on the stove using maple water (if using otherwise plain water). While oats are cooking prepare any toppings you may want. When the oats are done cooking remove from heat and stir in protein powder, maca, cinnamon, and non dairy milk until smooth. Pour into a bowl and top with toppings as desired and a drizzle of maple syrup. Shown I used pear but another favorite combo is caramelized bananas. Blend or stir together milk, protein (if using), maca, cinnamon, and maple syrup. Pour into a jar and stir in oats and chia seeds if using. Cover and place in the refrigerator for 4 hours or preferably overnight. Remove from the refrigerator, give it a quick stir and top with optional toppings as desired if you'd like to enjoy cold.To enjoy warm remove lid and warm in the jar or transfer to a bowl, warm for a couple minutes until desired temp, stir, top with optional toppings as desired. Enjoy! 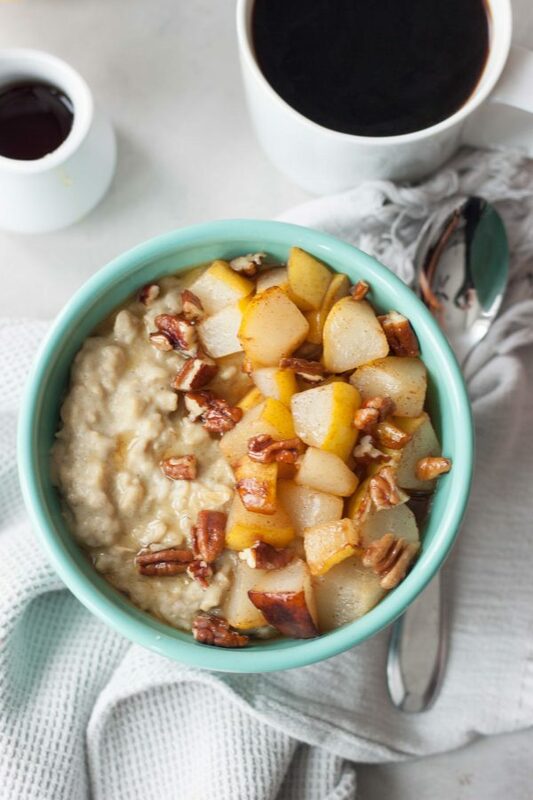 The pears are so cozy and worth the extra few minutes to cook! I have been using maca for about 2 months now… purely by mistake because I confused it with matcha powder hahha. This is a great recipe to use it for! Wow that’s a big difference, I hope you noticed before you tried it. I love maca and there are so many ways to use it I’m sure you will find many delicious recipes to add it to. This sounds so amazing, Sarah! I love a good oatmeal! Thank you, some mornings you just need a little help warming up and a little energy boost! Mmm, this looks so warm and comforting! It’s the perfect breakfast to wake up to on these cold mornings we’re having! Yes and a little extra boost to boot, not that one is needed when it’s this cozy and delicious! Maca is every where but it is optional and can be enjoyed without, I leave it out when making it for the girls. Yes, delicious with benefits! Hope you enjoy it, keep me posted! I’ve never put maple water in my oats. I’ve gotta try though. What a great idea! I add it in for the magnesium as I have it on hand for smoothies and sipping. Thank you, hope you enjoy it! What a beautiful cozy bowl of oats! These look so delicious. Love your versions! Thank you Julie, delicious and healthy can’t beat it. I almost didn’t share it as I thought it was “boring” but was so good I had to.